Note: On NNR today Kelron Sykes, College Fooball Insider & I discussed the NFL and college football. The podcast is on https://fryingpansports.com/radio-show/. I am a suffering Cleveland sports fan and a former owner of the Cavs. I bought stock in the Cavs when they were pubically owned. I was there in the old old downtown arena when the Cavs beat the Lakers for the first time. LeBron, you have given this old Cavs fan the best gift possible—A chance to win. Whatever happens this year, the fans owe you a great deal of thanks. You and the other Cavs will give us a chance to cheer for a winning team. I loved the way you played the first time you were here. You and the Cavs came close to winning it all. 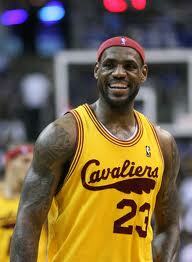 Now you have the kind of supporting roster that would never have come to Cleveland without you being here first. Like all Cavs fans I hope for the team is that they win the title. But whatever happens we support you and the team. Thanks again for bring an old man hope.